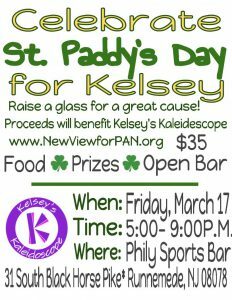 Looking for a fun and festive St. Paddy’s Day event? Join us for a St. Paddy’s Day Happy Hour on Friday, March 17 from 5-8 P.M. at Phily Sports Bar for games, food, drink specials, contests, and fun. Win some liquor, raise a glass, and support our cause. Save the date. More information will be posted in the coming days.